The new sprocket driven DEL/DRIVE conveyor belts combine the advantages of mono material conveyor belts and those of the modular plastic belts. These conveyor belts with teeth on the underside are adapted to carry potentially heavy loads over long distances, particularly in the food handling industry. The forward driving force provided by the sprockets removes the need for tensioning the belt and the risk of belt slip. Guidance is easier, and stress in the conveyor is highly reduced. Waterproof, homogenous and unarticulated, these belts strongly resist the development of bacteria and increase ease of cleaning. The 50mm pitch makes our belts compatible with some standard sprocket driven modular conveyor belts. However, for best results, our dedicated sprockets should be used. The replacement of existing modular conveyor belts does not generally require much or any transformation of the conveyors. DEL/DRIVE 50 - Made from food quality polyurethane, it is the ideal solution for handling light to medium weight loads. DEL/DRIVE 50AM - antimicrobial - with an antimicrobial additive it inhibits bacterial development and avoids contamination of transported products. DEL/DRIVE 50H - Made from polyester elastomer, it is recommended for medium to heavyweight loads and can be used with large roller spacing. 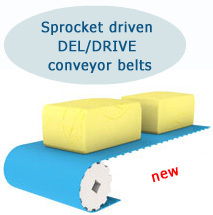 DEL/DRIVE 25 - the thickness and reduced sprocket spacing permits the use of smaller diameter rollers, reducing the space required by the conveyor and improving transfer of transported goods.